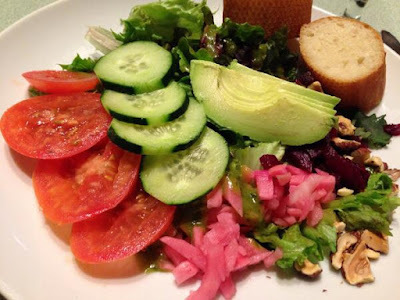 Brandywine Kitchen is one of those restaurants that started out as incredibly vegan-friendly, and then gradually over time began to grow less and less that way. They used to have a couple of fantastic vegan sandwiches, but sadly those have long since disappeared and were not replaced with anything new. Currently, they make a salad I really like and the basil vinaigrette is vegan, and they also usually have a vegan lentil soup. 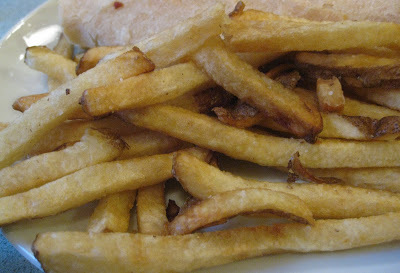 Their french fries were once considered to be the best in town, made with organic potatoes fried in peanut oil in a fryer where no other food was cooked, making them vegan. However the last few times I had them they were a little soggy, and it's been awhile since I have been in. As you all know, things in the restaurant world can change quickly, so it's a good idea to double-check and ask to make sure they are still vegan if you want to be on the safe side. Next time I stop in I will ask my usual questions and if there is anything new to add or take away from this list of options, I will post it here. Just curious if you, or any of your readers, have eaten here recently. Any vegan options? Hi! I went back not too long ago and they had a vegan soup and a salad that could be made vegan, and I liked both of those. Still wish they would get another vegan sandwich option! To be honest, I don't go there nearly as much as I used to, and I have heard from a few people about their fries not being quite as good as they used to be. I think they are still vegan but I am not positive--need to double-check and make sure they still have a separate fryer for their fries because if they don't, that might explain the issue they were having with soggy french fries. :( I will update you as soon as I have more to share! THANKS!